Tickets Available For Arsenal FC Home Games at Emirates Stadium, London. 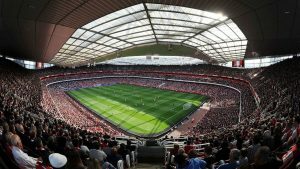 Did you know that Durham Indoor Soccer Centre has two season tickets for Arsenal FC’s home ground – The Emirates Stadium in London. These tickets are available for purchase by customers, clients and friends of Durham Indoor Soccer Centre. Theme Designed by Elegant Themes | Powered by GSL Technologies Inc.